Thanks so much for bringing our wonderful dream kitchen to life, everyone that comes to our home comments on how lovely the kitchen looks and I am sure not only is it down to my husbands workmanship, but also your complete attention to detail, and your fantastic invisible joints even other professional joiners are impressed. We just wanted you to know that you have made a very very fussy pair of homeowners very very proud of their kitchen... thank you. We dont often recommend to others but as you are aware will be recommending you to all and sundry.... the agent was bowled over by the kitchen.... so i have given her your name.... Thanks once again.. I'm really pleased with the finished result Have a relaxing Christmas! Kept meaning to send you these, but forgot. Today someone asked me who had done them so I passed your name on but it reminded me about the photos. This is just to say a big thank you for the work you completed at my house recently. My kitchen looks great and as before I am really happy with the counters, they really finish it off. 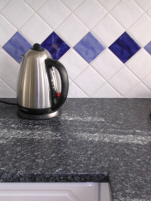 Thanks for the excellent job you made of cutting and fitting our worktops on Thursday. 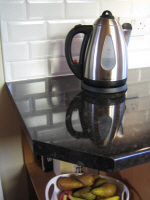 I will certainly recommend your services if anyone I know wants some worktops fitting. Your unpaid advice on helping to fit my new kitchen was also appreciated and things are starting to look like a real kitchen again. Haven't been able to write to you sooner due to a 'dreaded virus'. you have made in fitting our new work tops. I understand that you are seeing Sharon and Dave next Friday. We have assured them they are in good hands. Thanks for yesterday, it was great job and I can't believe you worked on your birthday. It looks like you take real pride in your work which is not so common these days. We eventually finished tidying up about 10pm which wasn't to bad at all considering how much sawdust was floating around. Have returned from Antigua to find a fabulous kitchen waiting for me. Thank you so much for all the help and advice you gave Trudy in my absence. I absolutely love my new kitchen and it couldnt have been done without you. 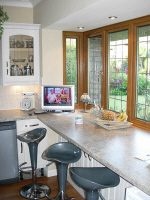 I certainly wouldnt hesitate to recommend you to anyone looking to have worktops put in their kitchen. By the way, my other half says the windsurfing in Antigua isnt as good as Southend or Thorpe Bay.(Honest). Finally got round to finding your website. Thanks a lot for a great job on 27th May, your advice on finishing off the rest of the kitchen was also much appreciated. Recommended you to a couple of friends, one should be in touch in the next month or two. - bathroom and little loo look great. 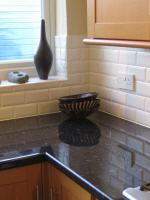 ...worktops look great & customer pleased as punch with 'em. 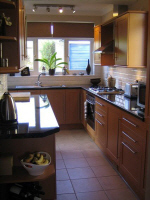 Finally got round to emailing you , thanks for ** Hollytree gardens Rayleigh, kitchen looks great see you on the next one.